The forces from within: the role of central spindle microtubules during chromosome segregation. Cell division comes in different flavours, namely mitosis and meiosis. In mitosis, two daughter cells arise after duplication and equal partitioning of the genome. Meiosis also involves duplication of the genome but this is followed by two successive rounds of chromosome segregation, generating gametes which are haploid cells (Duro and Marston 2015; Ohkura 2015). Chromosome segregation is achieved by a structure called the spindle, which consists mainly of microtubules (MTs). Spindle MTs contact chromosomes through a multi-protein complex called kinetochore, which assembles on centromeric DNA (Verdaasdonk and Bloom 2011). Centromeres can be localised on specific loci (monocentromeres) or span the whole length of chromosomes (holocentromeres). Regardless of the type of cell division and nature of the centromeres, there is a universal need for chromosome segregation and this always involves MTs. While the most studied mechanism for MT-dependent chromosome movement involves pulling forces generated by MTs emanating from spindle poles making end-on contacts with kinetochores (kMTs), there is evidence for pushing forces that are exerted from within the segregating chromosomes (Khodjakov et al. 2004; Nahaboo et al. 2015; Laband et al. 2017; Vukušić et al. 2017). Most attention has been given to kMTs, which has provided great insight into the detailed mechanisms of poleward chromosome movement. However, the behaviour of central-spindle MTs, those present within segregating chromosomes, has been far less studied. Early evidence suggested a central-spindle-based mechanism during C. elegans female meiosis (Dumont et al. 2010) and it was later shown that the central-spindle was indeed required for chromosomes segregation (Laband et al. 2017). Very recently, tomographic reconstruction of the worm female meiotic spindle showed that central spindle MTs can make end-on contacts with the inner surface of segregating chromosomes (Redemann et al. 2018). In the present preprint, the authors set out to elucidate the link between central-spindle MT dynamics and chromosome segregation. 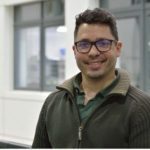 In order to achieve their goal, they analyse three different spinldes and a variety of methodologies including photoconversion/photobleaching, laser ablation, and electron microscopy. Yu et al analysed the human mitotic spindle, the C. elegans mitotic spindle, and the C. elegans female meiotic spindle to i) characterise central spindle MT sliding; ii) compare MT sliding and chromosome segregation speeds, and iii) test the impact of ablating central spindle MTs on mitotic and meiotic chromosome segregation (Yu et al. 2019). One of the key observations is the fact that central spindle microtubules slide apart at the same speed as chromosome segregate (See Figure). The authors use photoconvertible, mEOS3.2-tagged tubulin to track the sliding behaviour of the central spindle microtubules. In the bottom panel, a kymograph is shown to compare the speeds of MT sliding, chromosome segregation, and spindle poles movement. This kymograph is a very good indication of the key message of the preprint. The figure is reproduced from the preprint’s Figures 2B, C.
By ablating MTs between poles and chromosomes, the authors show that not only chromosomes and central spindle remain somewhat stable, but also that chromosomes segregate. In other words, chromosomes segregate without kinetochore microtubules. This preprint supports a general a role for central spindle MT dynamics in chromosome segregation. The extent to which this mechanism contributes to chromosome segregation may vary among species. For example, in C. elegans female meiosis where kinetochores are disassembled and seem dispensable for segregation (Dumont et al. 2010; Muscat et al. 2015; McNally et al. 2016; Laband et al. 2017), this central spindle-based mechanism may become the prevailing one. Overall, the key findings of this preprint are that i) central spindle MTs slide apart at virtually the same speed as chromosomes segregate in the different systems analysed; ii) damaging the central spindle causes an immediate halt in chromosome movement; and iii) spindles contain microtubules with both ends between segregating chromosomes. I was initially attracted to this preprint due to its close relation to my own research. Technically, I am fascinated by the ablation methodology, especially using femtosecond pulse laser to achieve a complete but reversible halt in chromosome segregation. Also, it seems to be one of those cases in which the authors address a very clear question (not simple to test though) and perform a variety of techniques in different model systems to test it. Also key to a great piece of work is the fact that this generates new questions which are likely to engage the wide cell division field and will lead to new exciting discoveries. 1) What protein(s) regulate central-spindle MT sliding? While the CLASP orthologue CLS-2 plays a role in ‘pushing’ chromosomes away during meiosis (Laband et al. 2017) and mitosis (Nahaboo et al. 2015), how CLS-2 affect microtubule dynamics within the central spindle is not entirely understood. 2) How is MT sliding mechanistically coupled to chromosome movement? In the case of MTs making end-on contacts with the central-spindle facing side of, is there a ‘kinetochore-like’ structure involved? 3) In the case of female meiosis, evidence suggests that CLS-2 plays a role from mid-anaphase (McNally et al. 2016; Laband et al. 2017; Redemann et al. 2018), leaving an open question as to what mechanism(s) are in place to achieve the first step of chromosome separation in the absence of end-on MT-chromosome contacts? 4) It should be noted that in the current preprint as well as in previous work (Nahaboo et al. 2015), some of the conclusions had to be reached after reducing cortical pulling forces (GPR-1/2 depletion). It will be interesting to know to what extent the proposed MT sliding-dependent segregation depends on reduced cortical pulling forces. Dumont J, Oegema K, Desai A. 2010. A kinetochore-independent mechanism drives anaphase chromosome separation during acentrosomal meiosis. Nat Cell Biol 12: 894. Duro E, Marston AL. 2015. From equator to pole: splitting chromosomes in mitosis and meiosis. Genes Dev 29: 109. Khodjakov A, La Terra S, Chang F. 2004. Laser microsurgery in fission yeast; role of the mitotic spindle midzone in anaphase B. Curr Biol 14: 1330. Laband K, Le Borgne R, Edwards F, Stefanutti M, Canman JC, Verbavatz JM, Dumont J. 2017. Chromosome segregation occurs by microtubule pushing in oocytes. Nat Commun 8: 1499. McNally KP, Panzica MT, Kim T, Cortes DB, McNally FJ. 2016. A novel chromosome segregation mechanism during female meiosis. Molecular Biology of the Cell 27:2576. Muscat, C. C., Torre-Santiago, K. M. , Tran, M. V. , Powers, J. A., and Wignall, S. M. (2015). Kinetochore-independent chromosome segregation driven by lateral microtubule bundles. Elife 4: e06462. Nahaboo W, Zouak M, Askjaer P, Delattre M. 2015. Chromatids segregate without centrosomes during Caenorhabditis elegans mitosis in a Ran- and CLASP-dependent manner. Molecular Biology of the Cell 26: 2020. Ohkura H. 2015. Meiosis: An Overview of Key Differences from Mitosis. Cold Spring Harbor Perspectives in Biology 7(5). pii: a015859. Redemann S, Lantzsch I, Lindow N, Prohaska S, Srayko M, Müller-Reichert T. 2018. 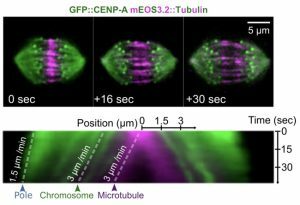 A Switch in Microtubule Orientation during C. elegans Meiosis. Current Biology 28: 2991-2997.e2992. Verdaasdonk JS, Bloom K. 2011. Centromeres: unique chromatin structures that drive chromosome segregation. Nature Reviews Molecular Cell Biology 12: 320. Vukušić K, Buđa R, Bosilj A, Milas A, Pavin N, Tolić IM. 2017. Microtubule Sliding within the Bridging Fiber Pushes Kinetochore Fibers Apart to Segregate Chromosomes. Developmental Cell 43: 11-23.e16. Yu C-H, Redemann S, Wu H-Y, Kiewisz R, Yoo TY, Farhadifar R, Muller-Reichert T, Needleman D. 2019. Central spindle microtubules are strongly coupled to chromosomes during both anaphase A and anaphase B. bioRxiv 537290. This is an excellent question, and we think that answering it will be one of the main challenges for future research. One practical difficulty will be to distinguish between proteins that indirectly influence central-spindle MT sliding (perhaps by causing defects in metaphase that later manifest in anaphase) and proteins that directly regulate this process. Central-spindle MTs could be coupled to chromosomes through end-on attachments, side-on attachments, or indirectly, through connections with kinetochore fibers. Or all of these different types of connections could contribute, or different ones could dominate in different systems. Our results, and previous data from a number of groups, can be interpreted as supporting all of these different possibilities. It will be important to investigate how MTs interact with chromosomes on regions outside of the kinetochore. However, the difficulty of this task should not be underestimated: despite the very large body of very high-quality work, even MT-kinetochore interactions remain poorly understood! The Wignall group has argued for the importance of MTs which laterally contact chromosomes. Such MTs might drive the first steps of chromosome separation, perhaps through MT sliding, or the activity of dynein. 4) To what extent the proposed MT sliding-dependent segregation depends on reduced cortical pulling forces? Our most convincing evidence for a strong coupling between central spindles MTs and chromosomes in anaphase of C. elegans embryos is in a gpr-1/2 RNAi background. Surprisingly, anaphase chromosome motion in gpr-1/2 RNAi embryos is very similar to wild type, despite having highly reduced pole motion. This suggests that the mechanism of chromosome motion might not be significantly affected by gpr-1/2 RNAi, and in our manuscript we present some additional data that further argues that point. As there is evidence for a similar strong coupling between central spindles MTs and chromosomes in unperturbed human mitotic spindles and C. elegans meiotic spindles, it seems that this might be a widespread phenomenon.